My friend had her first baby! He is a precious child, and I don’t throw baby compliments around. Apparently tiny humans are my only excuse to sew (see: here, here and here). 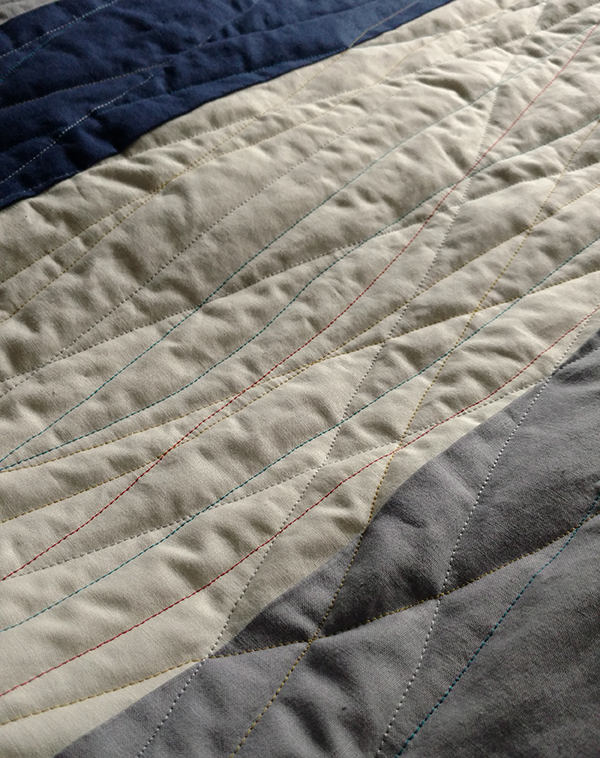 The quilt I made for her new baby evolved from something totally flat and lifeless into a piece I ended up really digging. It was super simple and a departure from my very first quilt attempt four years ago. After finishing the super simple front, I wasn’t confident that these rows of solid colors could come together into something beautiful. 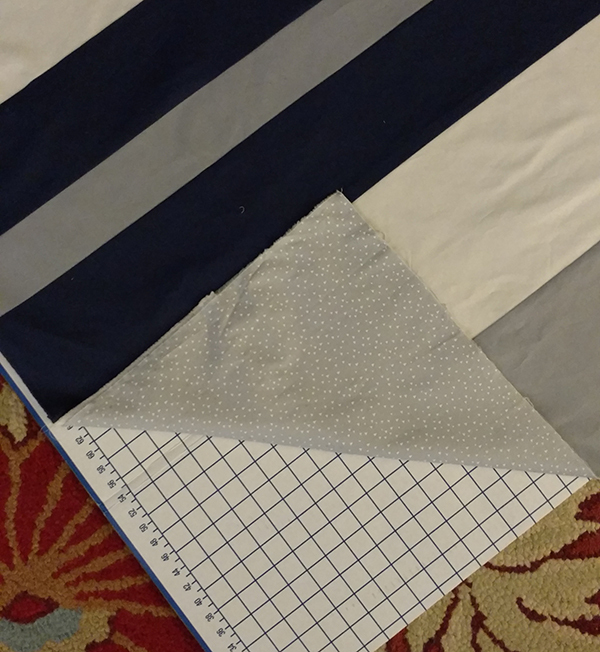 I was doubting myself and the project, but I’d promised my friend a quilt so I kept going. After all, my friend had planned to make the quilt the weekend before her baby was born, but I scoffed and told her to sleep instead. I’d take care of the quilt. This is how I get around to doing anything creative — I put it into the universe that it will happen. If it’s just for me it’s never going to come to fruition. But if it’s for my best friend’s first baby, I’m on it! Anyway, I plugged ahead, even with that sad, flat row of stripes staring at me. 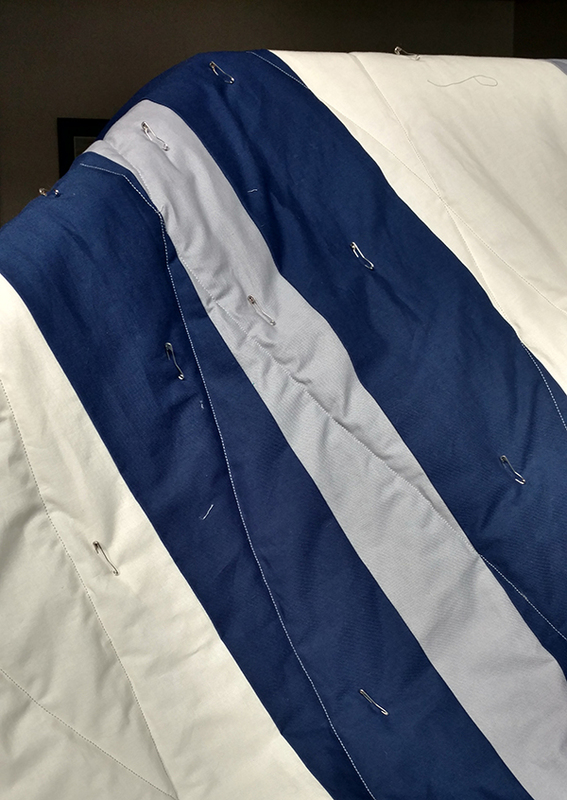 I sandwiched the batting between the front and back layers and pinned everything in place to attempt machine quilting. Turns out that it’s not an easy feat on a little sewing machine, even if the piece only measures 43 x 43 inches. 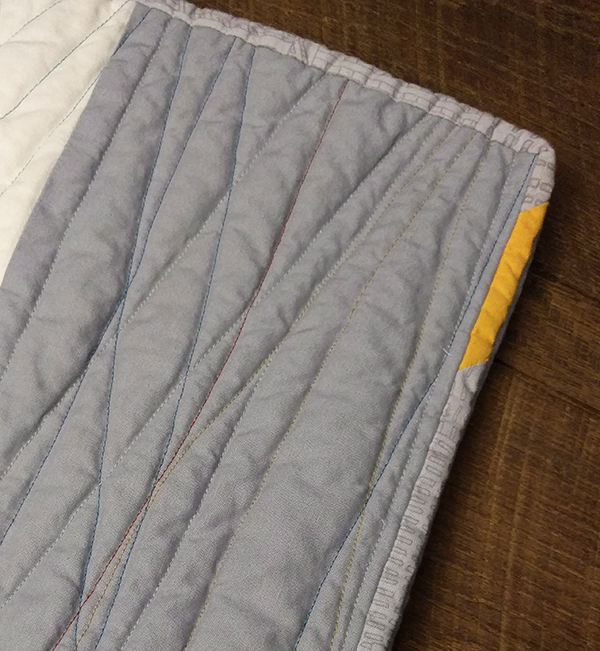 I rolled it up and wrangled it into my tiny sewing machine, and then I dedicated several hours of stitching contrasting colors to quilt it. I’d start at one corner and zig-zag across to the other – first with grey thread, then with teal, then yellow and red. As the rows of stitches grew, the project became more wieldy. I could flip it around with less furrowing of the brow and biting of the lip (and swearing under my breath), and I soon watched the batting start to puff up as the lines began to intersect and grow closer and closer to one another. Then I became kind of encouraged. It started to transform into a quilt I could get behind. I started to pick out some of my favorite intersections of color, just stopping to admire. My husband even stopped to examine it without my prompting, always giving two thumbs up. Stitching rows of color over and over actually kind of became an obsession and I wanted to keep going, but I figured it would be good to stop while I was ahead. The worst project mistakes come when I start to overdo things. I have a whole stack of sadly overdone and partially completed projects as proof. So I snipped my threads, squared my corners and made some binding with the random fabric selection I had. 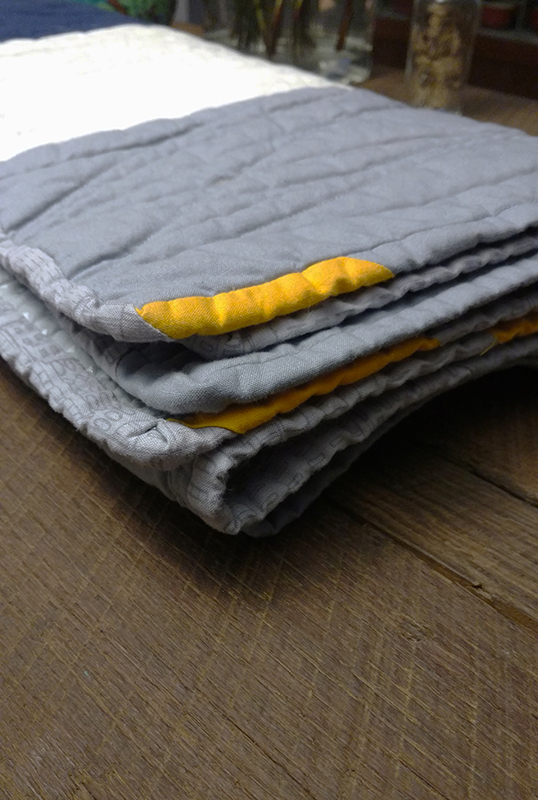 There was some grey left from the front of the quilt, a bit of grey fabric with a sketched cityscape and some bright yellow. I sewed the binding strips of varying lengths together without paying attention to where they would land, then prepped the binding. 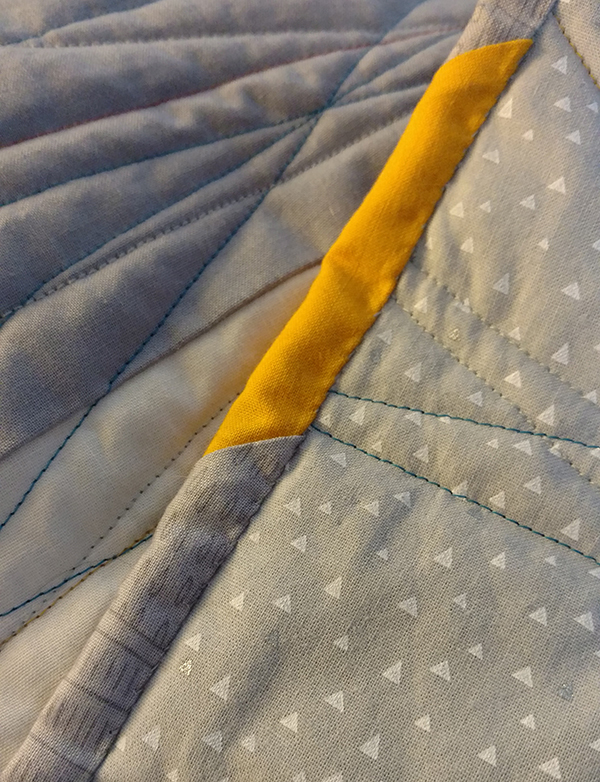 At first I’d planned to machine bind the quilt, but after I attached the binding to the front, I realized I didn’t want to risk machine stitches on the front or back that would compete with the colorful and slightly haphazard lines of quilting that made me so happy. And so I embarked on hand stitching the binding. It wasn’t that bad! I spent a chilly weekend drinking beer in the evening while watching shows on Netflix next to my husband and stitched away. I’m really pleased I took that extra time. See, not too shabby. 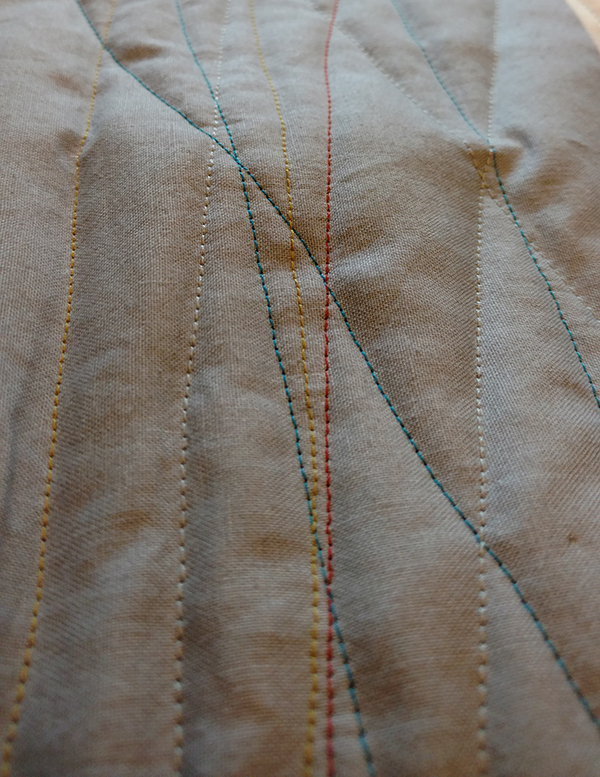 The triangle side is the back, and you can just see the tiny stitches holding the binding in place. Because everything I do is rushed and, until lately, natural light was scarce, I don’t have any full pictures of the quilt. This corner of it will have to do. 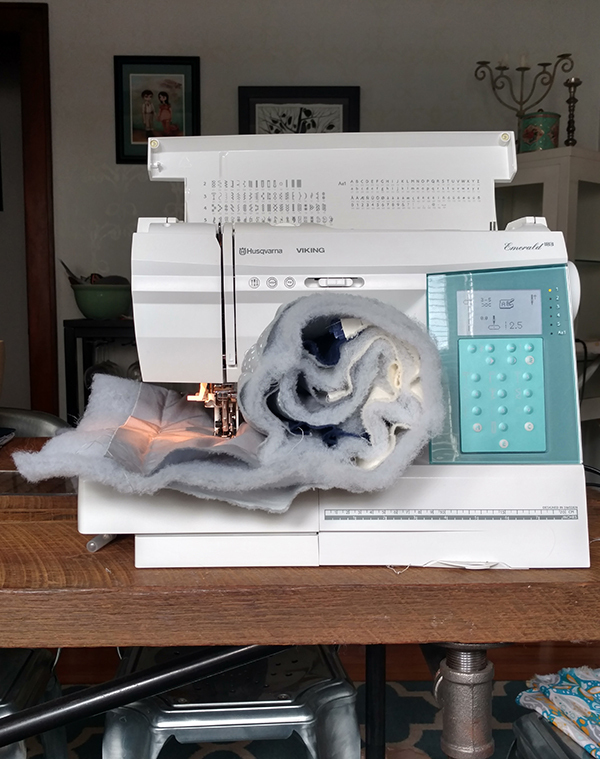 Maybe not an amazing feat for most sewers, but I was really happy to have a project that made me feel back on my sewing game. What projects have gotten you back into your productive/creative space?